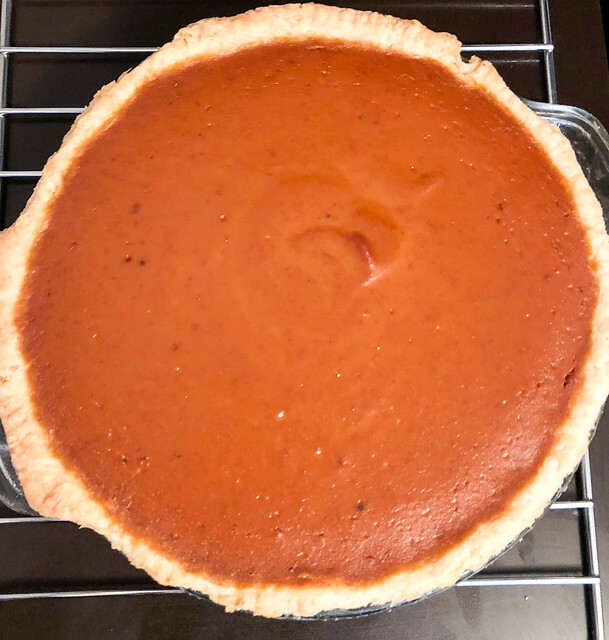 I have been wanting to redo my post about Anna Olson’s Perfect Pumpkin Pie since I published my post nine years ago! Right when I first started blogging. 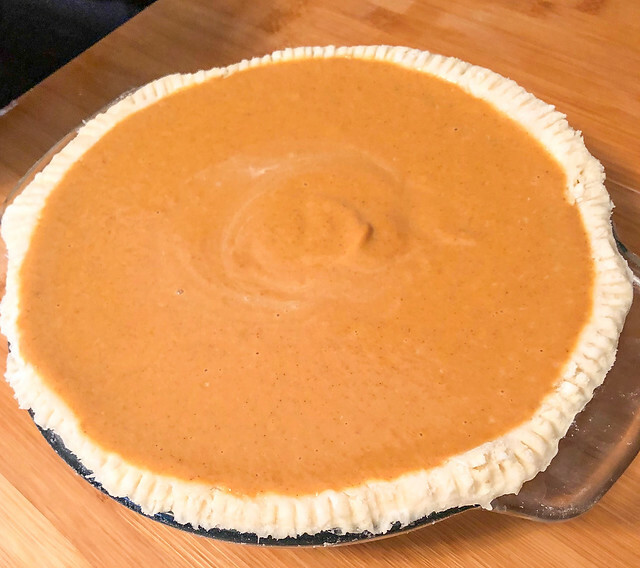 Mostly because I knew I could have better photographs but now also because I want to offer some help and wisdom so you can create the perfect pumpkin pie for the holiday season too. 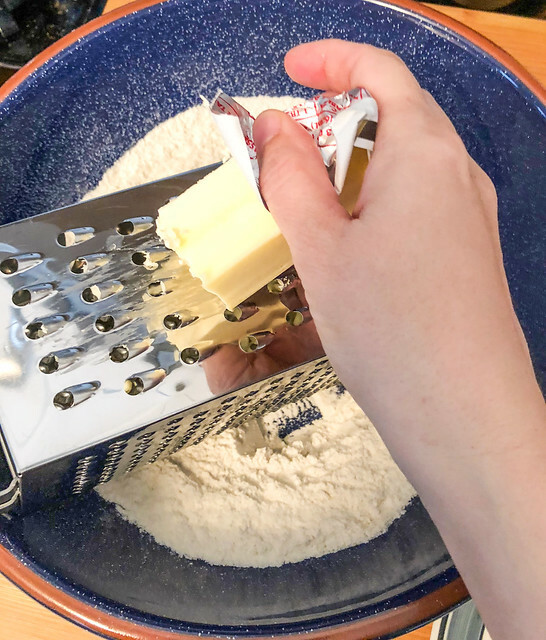 One of the brilliant elements of Anna’s recipe is she grates both the cold butter and cold shortening. 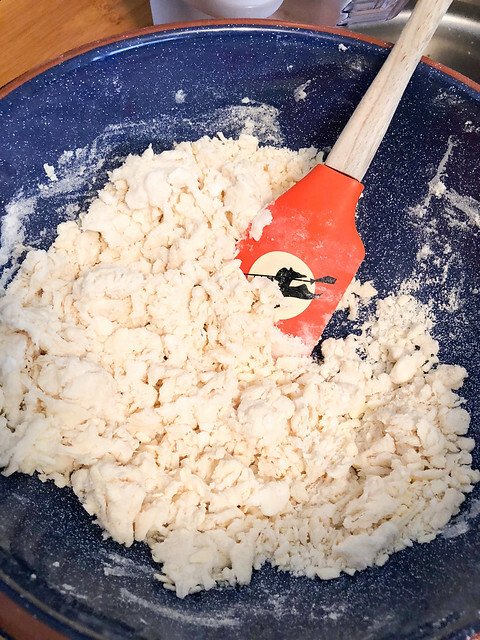 This way you do not need a pastry blender or a food processor. She does not use an egg to bind the crust, only ice water. As a result, add the water gradually around the circumference of the bowl. Use a spatula or spoon to bring the crust together. You will know there is enough water when there is minimal “dust” on the bottom of the bowl. 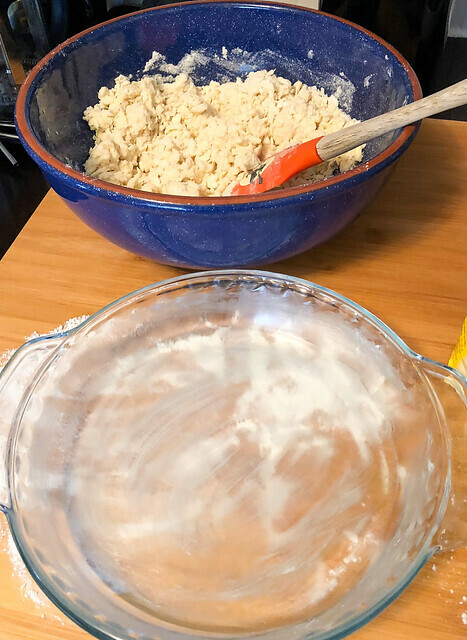 It may feel like you are adding too much water but if you do it slowly and gradually you should be OK.
At this point you can roll out your plastic wrap, dump the crust dough onto it and use the edges of the plastic to knead and bring the dough together. The key to a good pie crust is minimal handling! 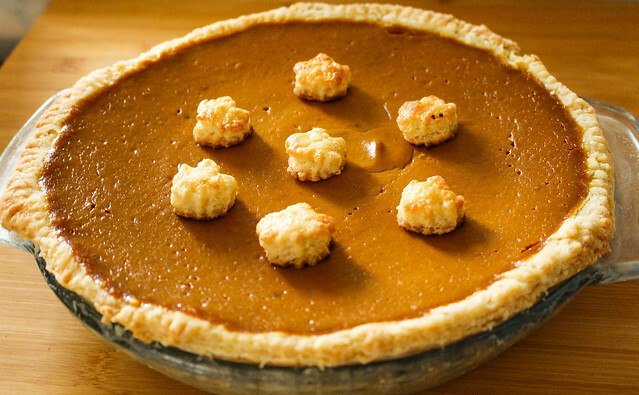 Have you ever had a pie crust not want to come out of the pie plate? I have and it is a nightmare! To avoid that from ever happening again, this is a trick I do every time I make a pie. First I grease the pie plate liberally with butter. 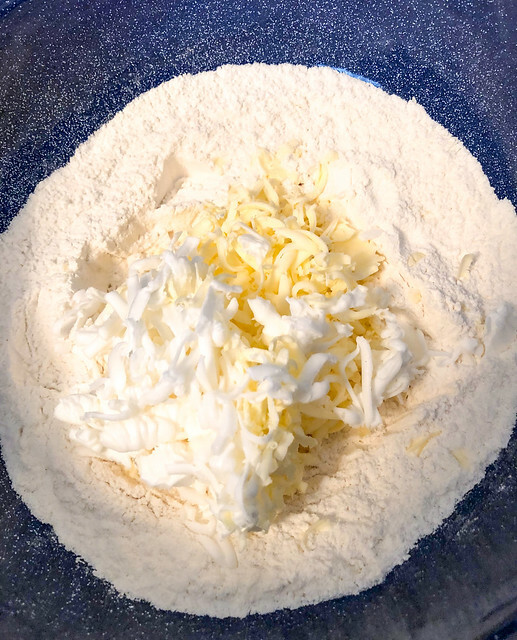 Then I add a dusting of flour in the center. 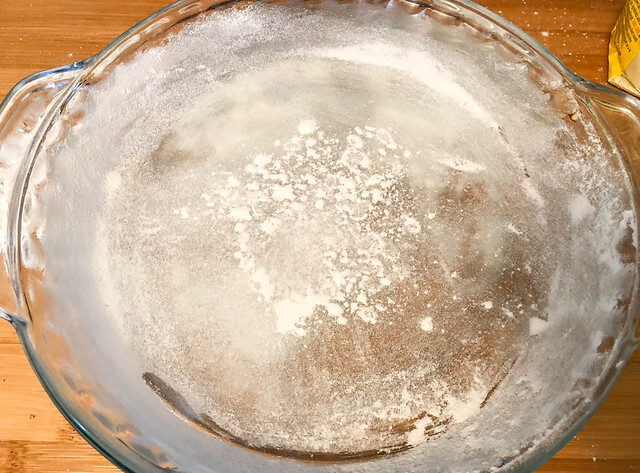 I lift up the pie plate and smack it around the edge and turn it at the same time so there is just the thinnest film of flour to help prevent sticking. 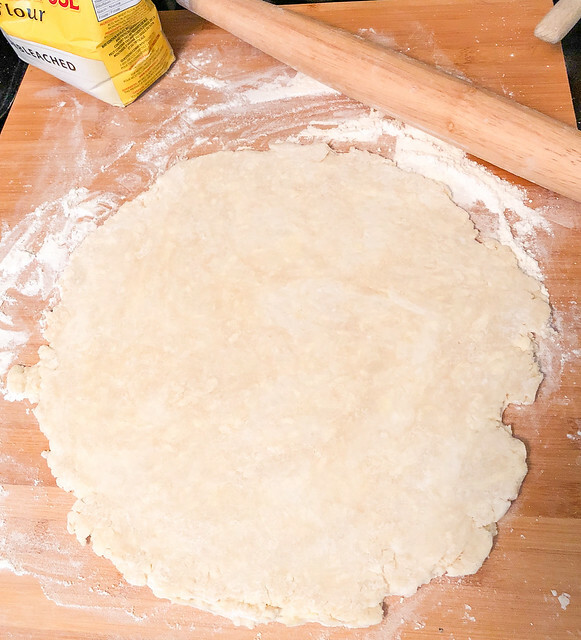 For the longest time when I first started to bake pies I could never get a circle when I rolled out the dough. Now I know the trick is to start with rolling two times, flip and turn, then roll two times again. Keep doing this but adding more times, flips and turns and you will keep the shape of the original disc. Remember to not let the scraps go to waste. 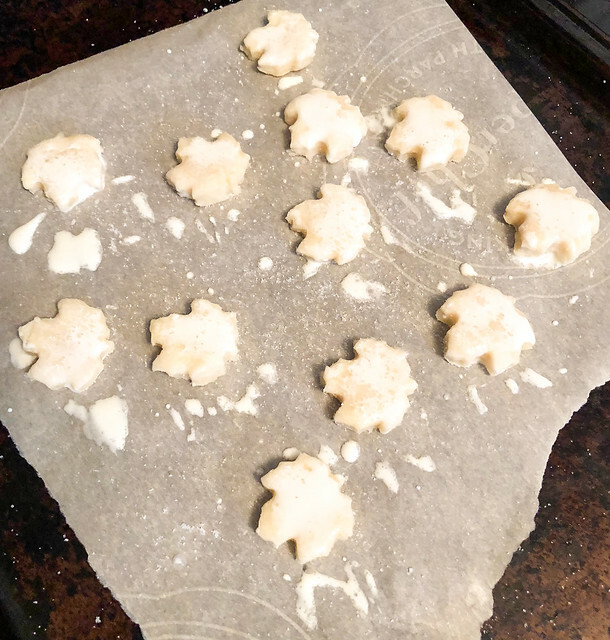 Make some cutouts, put on parchment paper and use an egg or heavy cream wash. Sprinkle with sugar and put in a 325F oven for 7-10 minutes. 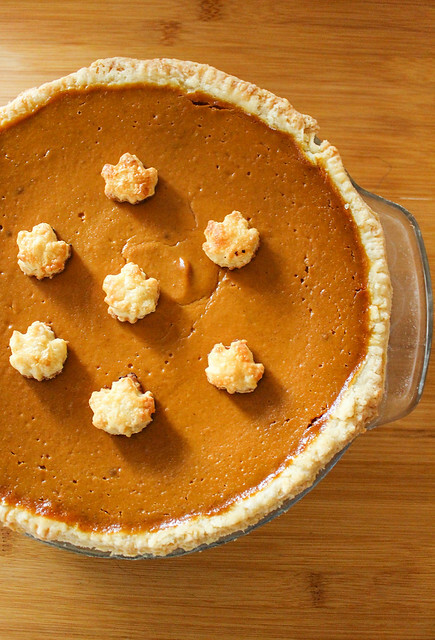 You can absolutely use your own home roasted pumpkin to make a pumpkin pie. Just note that it can take a long time to roast so do so the day before and then let sit in the fridge in a sieve over a bowl to make sure any excess liquid comes out. 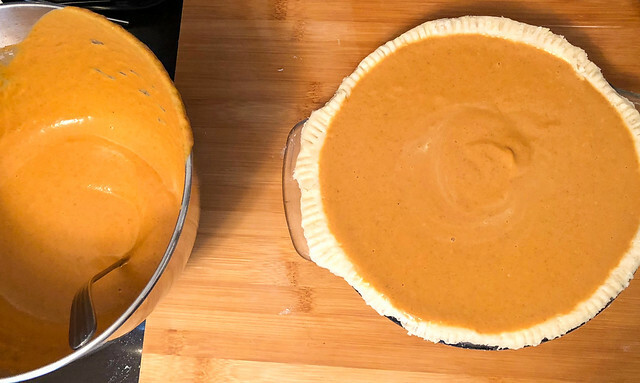 There is nothing wrong with using canned pumpkin for making your pie. I do it! Just make sure it is pureed pumpkin and not pumpkin pie filling. You want to add your own spices and flavourings. Eventually I ended up scooping out a lot of the filling since Anna’s Pumpkin Pie is incredibly light and moussie. I did not want it to not be cooked all the way and end up too runny. Next time I will use a deep dish pie plate. Once I find one. 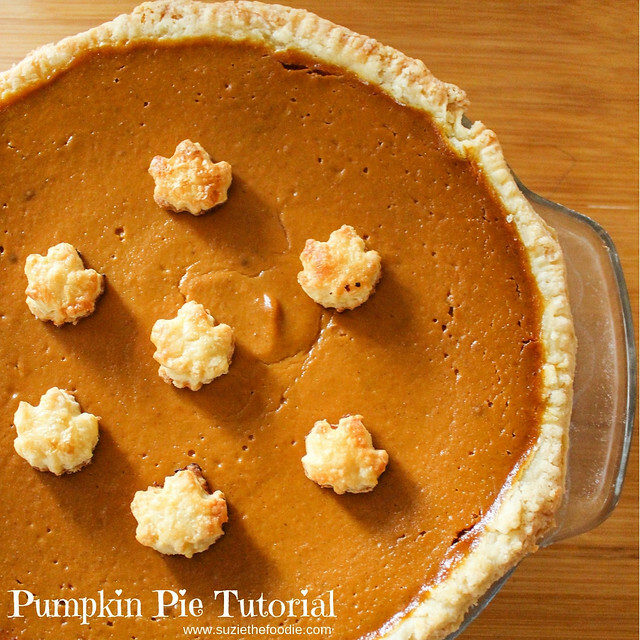 Do not forget you will need cooling and setting time for this pie so give yourself the day before to make it. So it looks great, right? Perfect to take over for Thanksgiving? I thought so too! I added the pretty maple leaves and was so happy with how it turned out. What I did not know at the time was the pie CRUST was not fully baked! Next time I will check the bottom, not just the rim of the pie plate for that beautiful golden crust. Damn it! 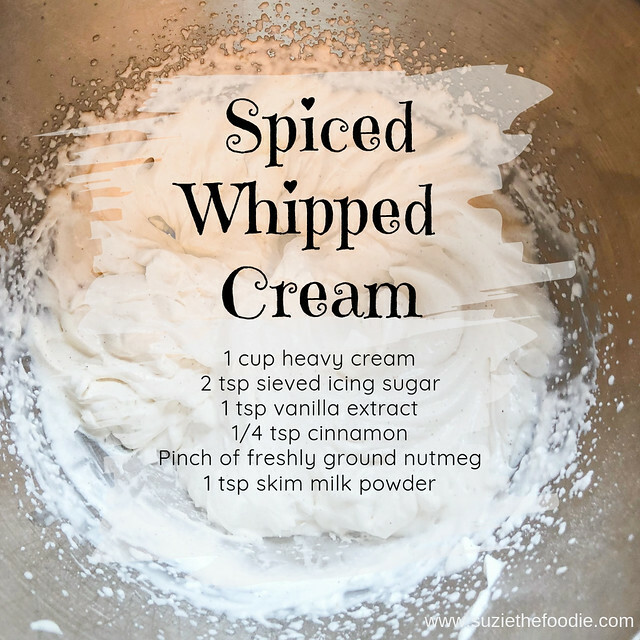 I am not a big whipped cream fan but this was a huge hit at the Thanksgiving party so make sure to make some for the pie. People LOVE it! 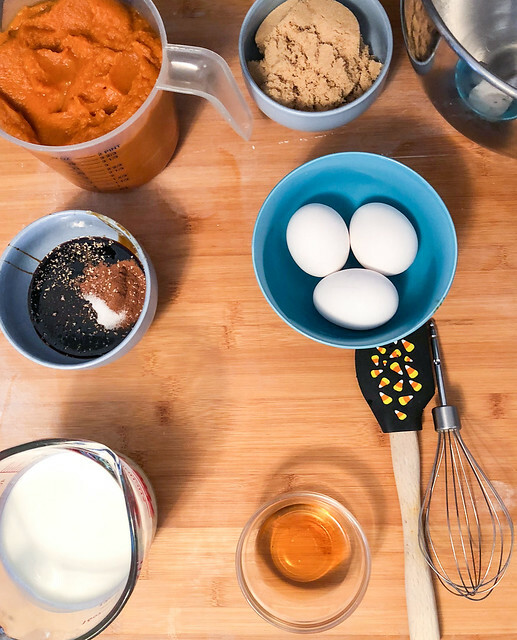 Whisk together: 1 cup whipping cream, 2 tsp icing sugar, 1 tsp vanilla extract (or bean paste if you have it), ¼ tsp cinnamon, a pinch nutmeg and 1 tsp of skim milk powder if you have it. This will stabilize the whipped cream so you do not have to re-whip when you make it to your foodie destination. I have made this pie in four different kitchens and even when there are issues, I still love it every time. I pretty much hate every other kind of pumpkin pie out there but this one? This one is special. I hope I answered any questions you might have but feel free to ask away in the comments section about any issues you may have. 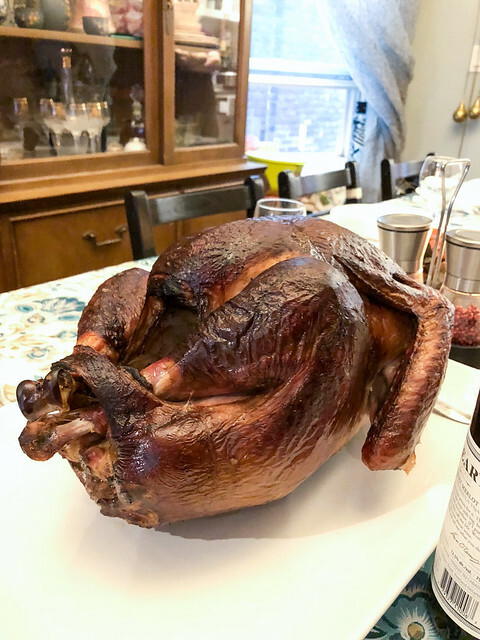 This is the smoked turkey we had at my first Thanksgiving back in Toronto. One of the best turkeys I have ever eaten. I hope that whatever you feast on for the holidays is delicious and the company wonderful. 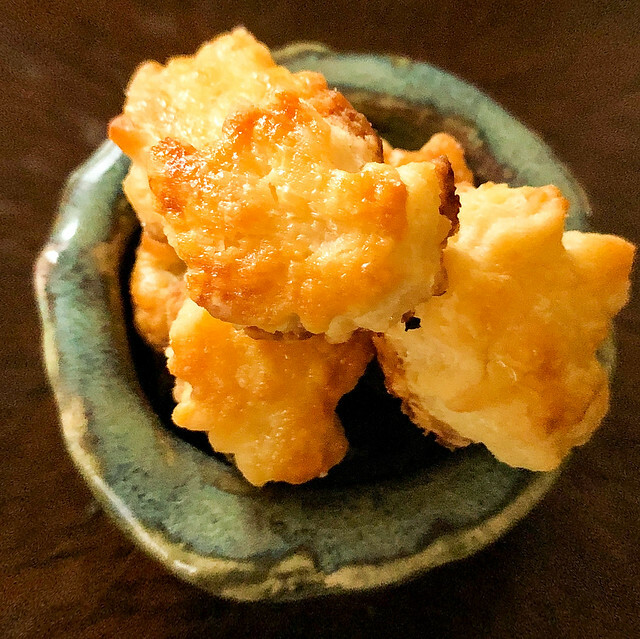 All your foodie photos are great as always but my fave is the delectable little golden pie crust maple leaves in the little pottery dish. I could eat a whole bunch of those! Thank you so much Debra! I love that photo too, I was so happy with how it turned out and they fit so well in that tiny ceramic bowl I made at the studio. Yes, super delicious! The children at the party insisted on having pieces with the maple leaves on top!